Alongside of tomatoes, watermelon has moved up to the front of the line in recent research studies on high-lycopene foods. Lycopene is a carotenoid phytonutrient that’s especially important for our cardiovascular health, and an increasing number of scientists now believe that lycopene is important for bone health as well. Among whole, fresh fruits that are commonly eaten in the U.S., watermelon now accounts for more U.S. intake of lycopene (by weight of fruit eaten) than any other fruit. Pink grapefruit and guava are two other important fruit sources of lycopene, although in the U.S., these fruits are more often consumed in the form of juice. Health scientists are becoming more and more interested in the citrulline content of watermelon. Citrulline is an amino acid that is commonly converted by our kidneys and other organ systems into arginine (another amino acid). The flesh of a watermelon contains about 250 millligrams of citrulline per cup. When our body absorbs this citrulline, one of the steps it can take is conversion of citrulline into arginine. Particularly if a person’s body is not making enough arginine, higher levels of arginine can help improve blood flow and other aspects of our cardiovascular health. There’s also some preliminary evidence from animal studies that greater conversion of citrulline into arginine may help prevent excess accumulation of fat in fat cells due to blocked activity of an enzyme called tissue-nonspecific alkaline phosphatase, or TNAP. If you’ve gotten used to thinking about the juicy red flesh at the center of a watermelon as its only nutrient-rich area—and far more nutrient-rich than the more lightly-colored flesh that is farther out near the watermelon rind—it is time to change your thinking. In a recent study, food scientists compared the nutrient content of flesh from different parts of a watermelon: flesh from the center, the stem end, the blossom end (opposite from the stem), and the periphery (the part nearest to the rind). What they’ve discovered were impressive concentrations of phenolic antioxidants, flavonoids, lycopene, and vitamin C in all of these different areas. The exact distribution of nutrients was also highly dependent on the variety of watermelon. But there was no area in any of the watermelon varieties that came out badly in terms of nutrients, and in many of the watermelon varieties, the flesh’s outer periphery contained impressive concentrations of most nutrients. Recent studies have confirmed the nutritional importance of allowing a watermelon to fully ripen. For example, research has shown that the biggest jump in lycopene content occurs at the time when a watermelon’s flesh turns from white-pink to pink. Yet when that flesh continues to ripen, resulting in a color change from pink to red, the lycopene content becomes even more concentrated. Prior to ripening, when the flesh of a watermelon is primarily white in color, its beta-carotene content is near zero. Even when allowed to ripen to the white-pink stage, a watermelon still contains very little of its eventual beta-carotene content. But as it moves from white-pink to pink to red, the beta-carotene content of a watermelon steadily increases. Like lycopene and beta-carotene, total phenolic antioxidants in a watermelon also increase consistently during ripening, all the way up until the appearance of fully red flesh. The bottom line: eating a fully ripe watermelon can really pay off in terms of nutrient benefits. The lycopene content of watermelons increases along with ripening, so to get the best lycopene benefits from watermelon, make sure that your melon is optimally ripe. (See our section entitled, “How to Select and Store” for practical tips on selecting a fully ripe watermelon.) The lycopene in watermelon is a well-documented inhibitor of many inflammatory processes, including the production of pro-inflammatory messaging molecules, the expression of enzymes like cyclo-oxygenase and lipoxygenase that can lead to increased inflammatory response, and the activity of molecular signaling agents like nuclear factor kappa B (NFkB). Lycopene is also a well-known antioxidant, with the ability to neutralize free radical molecules. Recent research has shown that the lycopene content of watermelon also remains very stable over time. 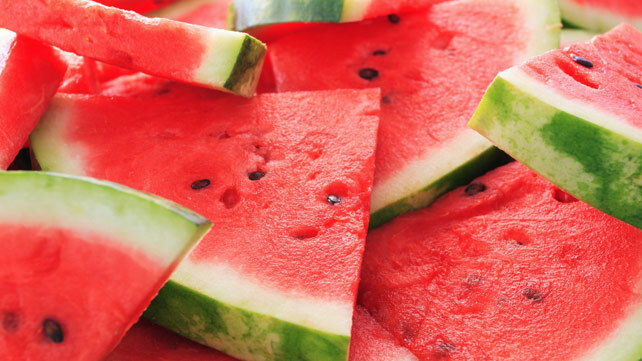 When two-inch cubes of fresh-cut watermelon were stored in the refrigerator at 36°F (2°C) over 48 hours, researchers found virtually no deterioration in lycopene content. That deterioration did not start to become significant until about seven days of storage, when it decreased by about 6-11%. While we do not recommend waiting seven days before consuming fresh cut watermelon, we believe that the excellent stability of watermelon lycopene over a two-day period is great news for anyone wanting to enjoy fresh cut watermelon over the course of several days. Antioxidant carotenoids found in watermelon include significant amounts of beta-carotene. Like lycopene, the beta-carotene in watermelon also increases with ripening. Red-pink fleshed watermelons typically contain far more lycopene and beta-carotene than yellow-white fleshed varieties. For example, one study we’ve seen showed red watermelon to contain over 600 micrograms of beta-carotene per 3.5 ounces of melon and over 6,500 micrograms of lycopene. By comparison, yellow-fleshed varieties were found to contain only 5-10 micrograms of beta-carotene and no measurable amount of lycopene. In red/pink-fleshed watermelons as a group, we’ve seen lycopene amounts that vary widely in a range of approximately 2,000–6,700 micrograms per 3.5 ounces of fresh melon. Beta-carotene in these red/pink-fleshed varieties also varies widely, in a range of approximately 5–325 micrograms. Because watermelon contains so many different phytonutrients—as well as key vitamins and minerals, as well as dietary fiber—your health is going to be improved by any watermelon variety that you choose. However, if you specifically want to maximize your lycopene and beta-carotene intake, you’ll most likely want to stick with red/pink-fleshed varieties of watermelon. It would be a mistake to ignore the important amount of vitamin C found in watermelon. In our Food Rating System, watermelon qualifies as very good source of vitamin C, even though the amount provided (about 12 milligrams per cup of fresh melon) is only 16% of the Dietary Reference Intake (DRI). However, due to its very high water content, the same amount of watermelon that provides us with 16% of the DRI for vitamin C only costs us about 46 calories, or about 2% of our total daily calories on a 1800-2000 calorie diet. That’s excellent nutrient richness, and it makes watermelon a great choice for increasing vitamin C antioxidant protection. One of the more unusual aspects of watermelon is its rich supply of the amino acid, citrulline. Citrulline is an amino acid that is commonly converted by our kidneys and other organ systems (including cells that line our blood vessels) into arginine (another amino acid). The flesh of a watermelon contains about 250 millligrams of citrulline per cup. When our body absorbs citrulline, one of the steps it can take is conversion of citrulline into arginine. The amount of citrulline found in fresh watermelon is not enough to make it a food that can automatically improve blood pressure or affect other problems like erectile dysfunction. But in animal studies, intake of watermelon has been shown to help support cardiovascular function, including improvement of blood flow (through relaxation of blood vessels, or what is technically called vasodilation). In humans, intake of watermelon has been shown to increase blood levels of arginine, but only when consumed in very large amounts. For example, in one study that we reviewed, participants consumed either three cups or six cups of fresh watermelon juice daily over the course of three weeks and experienced increases in their blood arginine levels of approximately 12-22%. Another fascinating new area of research involving watermelon and its citrulline content relates to the deposition of body fat. In animal studies, high intake of amino acid citrulline—followed by conversion of citrulline into the amino acid arginine—can result in the formation of arginine-related molecules called polyarginine peptides. These polyarginine peptides are able to block activity of an enzyme called tissue-nonspecific alkaline phosphatase, or TNAP. When TNAP activity is shut down, our fat cells (adipocytes) tend to create less fat (adipogenesis). Researchers believe that the connection between citrulline in food, arginine production by nitric oxide synthase, and fat cell metabolism may eventually provide us with additional tools for helping prevent over-accumulation of body fat. The amount of protein in watermelon seeds is approximately 1 gram per 24 seeds. At this rate, we’re likely to get several grams of protein when we eat several slices of whole, seeded watermelon. While we would not want to depend on watermelon as a key protein food, this valuable amount of protein in its seeds should at least remind us that a fruit like watermelon does have something to offer us in the way of protein benefits. At approximately two-thirds of one gram of dietary fiber per cup, watermelon does not rank as a good, very good, or excellent source of this nutrient in our ranking system. However, you’d be receiving about 3-4 grams of dietary fiber if you enjoyed 175–200 calories of fresh watermelon in the form of several large slices, and this dietary fiber would include a nice mix of soluble to insoluble fiber. (Insoluble fibers can provide special support to the digestive system, and soluble fibers can provide special support to the cardiovascular system.) So while watermelon is not a concentrated source of fiber, we often enjoy it in larger amounts that can provide us with great fiber benefits at a low calorie cost. Cucurbitaceae family, the watermelon is related to the cantaloupe, squash, pumpkin, cucumber, and gourd that grow on vines on the ground. Watermelons can be round, oblong, or spherical in shape and feature thick green rinds that are often spotted or striped. (Many people report, however, that they like the taste and predictable ripeness of a watermelon best if the watermelon is symmetrical in shape.) Watermelons range in size from a few pounds to upward of ninety pounds. Between 600–1,200 different varieties of watermelon exist worldwide, but all of these varieties belong to the same scientific genus and species of plant, called Citrullis lanatus. While we often associate a deep red/pink color with watermelons, there are many varieties that feature orange, yellow, or white flesh. These varieties are typically lower in the carotenoid lycopene than red/pink varieties. A good bit of controversy has arisen over the exact nature of seedless watermelons. Contrary to some information that you will find on various websites, seedless watermelons are not the result of genetic engineering. Seedless watermelons are the result of hybridization. By crossing a diploid watermelon (with two sets of chromosomes) and a tetraploid watermelon (with four sets of chromosomes), it is possible to produce a watermelon that contains triploid seeds (with three chromosomal sets). When planted, these triploid seeds will grow into seedless watermelons. Seedless watermelons will typically appear to contain some white seeds even though they are labeled as seedless. These white seeds are not actually seeds, but only empty seed coats. Ten years ago, it was somewhat rare to find seedless watermelons in the marketplace. Today, up to 85% of all watermelons produced in the U.S. are estimated to be seedless. This great increase in the availability of seedless watermelons is due to the vastly increased use of “non-bearing pollinators” by watermelon growers. Previously, growers were required to interplant rows of acreage with seeded, fruit-bearing watermelons in order to pollinate their seedless varieties. Today, they are able to pollinate with plants that produce flowers needed by bees, but yield no fruit. These non-fruit-bearing plants allow pollination to continue, but in a less time-consuming and space-consuming way. It’s possible to grow seedless watermelons most anywhere that seeded watermelons will grow. Some of the more common seedless varieties include Fandango, Super Cool, Honeyheart, King of Hearts, Queen of Hearts, Crimson Trio, Scarlet Trio, and SuperSweet. Some common varieties of seeded watermelon include Jubilee, Royal Jubilee, Royal Sweet, Crimson Sweet, Sangria, Fiesta, Sugar Baby, Baby Doll, and Charleston Gray. A 15–20 pound diploid, seeded watermelon will typical contain hundreds of seeds. Watermelons are generally believed to have originated in Africa several thousand years ago and to have traveled over time from Africa to Asia to Europe to North America. Their arrival in Asia and the Middle East is believed to date back to approximately 900–1,000 A.D., and their arrival in Europe is estimated to have occurred in 1300–1400 A.D. It was not until Europeans began to colonize North America that watermelons arrived in what is now the U.S.
Today, over four billion pounds of watermelon are produced each year in the U.S. About 85% of watermelons are purchased in fresh form by consumers. Although there is some watermelon production in virtually all states, about three-fourths of all U.S. watermelons are grown in Florida, California, Texas, Georgia, and Indiana. On an average, per person basis, we eat over 15 pounds of fresh watermelon each year. Second, look for a watermelon with a relatively smooth rind that is slightly dulled on top. The top and the bottom of a watermelon are worth determining and examining on a watermelon. The bottom or “underbelly” of a watermelon is the spot where it was resting on the ground. If that “ground spot” is white or green, the watermelon is unlikely to be fully ripe. A fully ripened watermelon will often have a ground spot that has turned creamy yellow in color. Opposite from the ground spot will be the top of the watermelon. In a fully ripened watermelon, that spot will typically not be shiny but somewhat dulled. The green color may appear in many different shades, however, from light green to deeper shades. Finally, some grocers will be willing to core an uncut watermelon so that you can have an actual taste. (If you decide not to purchase the melon, the grocer can slice it up and sell it in sliced form.) So consider requesting this if you are uncertain as to the quality. Wash the watermelon before cutting it. Due to its large size, you will probably not be able to run it under water in the sink. Instead, wash it with a wet cloth or paper towel. Depending upon the size that you desire, there are many ways to cut a watermelon. The flesh can be sliced, cubed, or scooped into balls. Watermelon is delicious to eat as is, while it also makes a delightful addition to a fruit salad. Watermelon is a wonderful addition to fruit salad. And fruit salad can be made days ahead since cut fruit, if chilled, retains its nutrients for at least 6 days. Watermelon is not a commonly allergenic food, is not known to contain measurable amounts of oxalates and is also not included in the Environmental Working Group’s 2012 report “Shopper’s Guide to Pesticides” as one of the 12 foods most frequently containing pesticide residues. During the past decade, non-organic watermelons grown in part of China became the topic of widespread controversy in the popular press following the use of a synthetic growth stimulator called forchlorfenuron in their cultivation. A combination of heavy rainfall and potential overuse of the growth stimulator actually caused many watermelons on farms in Jiangsu Province to burst open, drawing media attention to this practice. While we are not aware of any data on widespread use of synthetic growth stimulators in the production of non-organic watermelon, we have seen one study predicting residues of forchlorfenuron in the range of 1-5 ppb in watermelons raised with the use of this synthetic growth stimulator. If you are seeking to lower your risk of contamination with all synthetic additives in watermelon and other foods, we recommend purchase of certified organic watermelon, since synthetic growth stimulators and other synthetic additives are prohibited in organic food production. Watermelon is an unusual fruit source of the carotenoid lycopene and a rich source of phenolic antioxidants. Watermelon contains cucurbitacin E, a triterpene anti-inflammatory phytonutrient, and unusual amounts of the amino acid citrulline. Watermelon is a very good source of vitamin C. It is also a good source of pantothenic acid, copper, biotin, potassium, vitamin A (in the form of carotenoids), vitamin B1, vitamin B6, and magnesium. In addition to the nutrients highlighted in our ratings chart, an in-depth nutritional profile for Watermelon is also available. This profile includes information on a full array of nutrients, including carbohydrates, sugar, soluble and insoluble fiber, sodium, vitamins, minerals, fatty acids, amino acids and more. Read more background information and details of our rating system. Abdelwahab SI, Hassan LEA, Sirat HM et al. Anti-inflammatory activities of cucurbitacin E isolated from Citrullus lanatus var. citroides: Role of reactive nitrogen species and cyclooxygenase enzyme inhibition. Fitoterapia, Volume 82, Issue 8, December 2011, Pages 1190-1197. Altas S, Kizil G, Kizil M et al. Protective effect of Diyarbakir watermelon juice on carbon tetrachloride-induced toxicity in rats. Food and Chemical Toxicology, Volume 49, Issue 9, September 2011, Pages 2433-2438. Charoensiri R, Kongkachuichai R, Suknicom S et al. Beta-carotene, lycopene, and alpha-tocopherol contents of selected Thai fruits. Food Chemistry, Volume 113, Issue 1, 1 March 2009, Pages 202-207. Collins JK, Wu G, Perkins-Veazie P et al. Watermelon consumption increases plasma arginine concentrations in adults. Nutrition, Volume 23, Issue 3, March 2007, Pages 261-266. Dimitrovski D, Bicanic D, Luterotti S et al. The concentration of trans-lycopene in postharvest watermelon: An evaluation of analytical data obtained by direct methods. Postharvest Biology and Technology, Volume 58, Issue 1, October 2010, Pages 21-28. Edwards AJ, Vinyard BT, Wiley ER et al. Consumption of watermelon juice increases plasma concentrations of lycopene and beta-carotene in humans. J Nutr 2003 Apr;133(4):1043-50. 2003. Iakshmi AJ and Kaul P. Nutritional potential, bioaccessibility of minerals and functionality of watermelon (Citrullus vulgaris) seeds. LWT – Food Science and Technology, Volume 44, Issue 8, October 2011, Pages 1821-1826. Martins MJ, Negrao MR and Azevedo I. Watermelon: the value of higher plasma arginine concentrations. Nutrition, Volume 23, Issue 6, June 2007, Page 517. Paris HS, Amar Z and Lev E. Medieval emergence of sweet melons, Cucumis melo (Cucurbitaceae). Ann Bot. 2012 Jul;110(1):23-33. Epub 2012 May 30. Perkins-Veazie P and Collins JK. Flesh quality and lycopene stability of fresh-cut watermelon. Postharvest Biology and Technology, Volume 31, Issue 2, February 2004, Pages 159-166. Perkins-Veazie P, Collins JK. Carotenoid changes of intact watermelons after storage. J Agric Food Chem. 2006 Aug 9;54(16):5868-74. 2006. PMID:16881688. Poduri A, Rateri DL, Saha SK et al. Citrullus lanatus ‘sentinel’ (watermelon) extract reduces atherosclerosis in LDL receptor-deficient mice. J Nutr Biochem. 2012 Aug 16. [Epub ahead of print]. Tlili I, Hdider C, Lenucci MS et al. Bioactive compounds and antioxidant activities of different watermelon (Citrullus lanatus (Thunb.) Mansfeld) cultivars as affected by fruit sampling area. Journal of Food Composition and Analysis, Volume 24, Issue 3, May 2011, Pages 307-314. Tlili I, Hdider C, Lenucci MS et al. Bioactive compounds and antioxidant activities during fruit ripening of watermelon cultivars. Journal of Food Composition and Analysis, Volume 24, Issue 7, November 2011, Pages 923-928. Valverde A, Piedra L, Aguilera A et al. Analysis and residue levels of forchlorfenuron (CPPU) in watermelons. J Environ Sci Health B. 2007 Sep-Oct;42(7):801-7. Drive Buyers to your eBay Listings with BidVertiser. Get $20 in FREE Clicks.